Imagine ten nearly round white eggs snug in a hollow tree, lined with soft feathers plucked from the mother’s breast. The hen carefully tends the 2-inch eggs for about a month until the chicks hatch. Prompted by their mother’s call, downy day-old chicks clamber up to the opening in the tree and leap into space, plunging head-over-tail some 50 feet down to bounce on the forest floor. They follow their mother on a perilous journey, sometimes of over half a mile, to the relative safety of a marsh, beaver pond or woodland stream. She will protect the chicks for the next five weeks until they go out on their own. Such is the life of a nascent hooded merganser. Chicks take to the water right away to hunt aquatic insects. As they quickly grow, keen eyesight underwater enables them to hunt larger prey, such as tadpoles, frogs, small fish, mollusks, and crustaceans, including crayfish. Unique among our native pond-dwelling ducks, hooded mergansers eat fish as their main fare. Mergansers are expert divers. Swimming serenely, they suddenly disappear, leaving barely a ripple, and can remain submerged for up to two minutes. All birds have a nictitating membrane, a transparent extra eyelid; for mergansers, this serves as a diving mask that allows them to keep their eyes open underwater where they swim gracefully with webbed feet. Using wings to steer, they appear to fly through a liquid sky. At about 18 inches long and 1-1/2 pounds, hoodies are smaller than common and red-breasted mergansers. They have prominent crests and slim, serrated beaks. Males have rounded black crests on their heads, dominated by a large white patch fanning out from behind striking yellow eyes, which contrast with their black feathers. 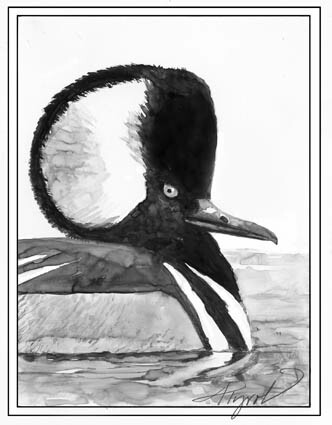 The black back is set off from the white plumage below the waterline and accented by a pair of black racing stripes that angle forward from the nape of the neck. The male’s reddish-brown flanks, just above the waterline, mirror the color of the female’s prominent crest. The crests make their heads appear elongated — like a waterfowl bouffant. Females and young are mostly covered with brownish-gray feathers. Males have pale yellow feet and legs; females have brown eyes and green legs and feet. Both sexes have short, spiky tails, often angled up from the water. Males start courting and pairing up with females in November, in preparation for mating and nesting the following spring. Their deep, raspy call sounds like a snore — similar to the mating song of a pickerel frog. During courtship, the male fans out his crest and bends his head back until it’s touching his body, all while swimming alongside the female. Then he bobs his head and makes short courtship flights. A receptive female responds in kind by bobbing her head and spreading her tail over the water. After mating, the male swims excitedly around his prize. Females sometimes lay their eggs among those of other cavity nesters including fellow hoodies, wood ducks or common goldeneyes. When winter arrives, hoodies leave the small rivers and ponds of summer and move out onto lakes, estuaries, and marshes. According to McGowan, hooded mergansers are short-distance migrants that don’t leave North America, flying from southern Canada and the northern United States to the southern states. “Local conditions determine their movement. If waterfowl have open water, they’ll stay around for the winter,” McGowan explained. They often flock with ruddy ducks and buffleheads. Breeding starts when migrants return in late March. At one time, hooded mergansers were decreasing in number, in part because the large hollow trees they need for nesting became scarce. But they’ve adapted to using the artificial nest boxes meant to attract wood ducks. In addition, forests have matured, creating more habitat for nesting, nurseries and feeding. “Between the 1980 and 2000 Breeding Bird Atlas surveys in New York,” said McGowan, “the occurrence of hooded mergansers more than doubled. They like beaver ponds, and there are more beavers now than there have been for a long time. Their breeding range has also moved south, probably due to reforestation over the past 100 years, which has improved their habitat.” The occurrence of breeding hooded mergansers nearly tripled in Vermont between 1981-2007, according to findings of the first and second Vermont Breeding Bird Atlas, edited by the Vermont Center for Ecostudies. National Audubon predicts that, as the climate warms, hooded mergansers will significantly expand their winter ranges northward and live year-round where they are currently found just during the breeding season. Researchers in Manitoba discovered that in 2001 hooded mergansers were returning to their breeding grounds 32 days earlier than they had been returning in 1939. Despite its ever-changing environment, the endearing, diminutive waterfowl that is known to the Cree as the “beaver duck” is doing just swimmingly.